A city of easy money. Nate Aspinal returns to the city from a holiday to find two of his employees murdered. Both victims are found in hotel bathrooms – with the skin of their fingers and toes removed. 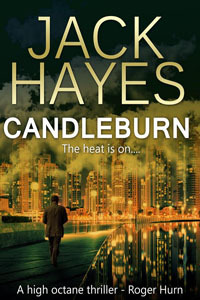 All clues point to the infamous ‘Candle’ terrorist group who are rumoured to burn their victims during interrogations. As Nate begins to discover more about the terrorists, his young family are kidnapped by the vengeful ‘Candle’ in an attempt to silence him. Nate soon realises he is caught in the middle of a terrible conspiracy. Royal lives are in danger, and he must convince the authorities disaster is about to strike… before it is too late. - Roger Hurn, bestselling author of ‘Business is Murder’.